Do each exercise in a super-set fashion (back to back with 30 seconds to no rest in between exercises). Each exercise should be performed for 10 reps. Once you get through every exercise, repeat for two to three sets. Holding the ball in front of you with your feet hip distanced apart, step back into a lunge and press the ball overhead. When you lunge, prior to pushing the ball overhead, you should watch that your toes are all facing forward, you are balancing on the ball of your back foot with your heel lifted, and both knees are bent ninety degrees. 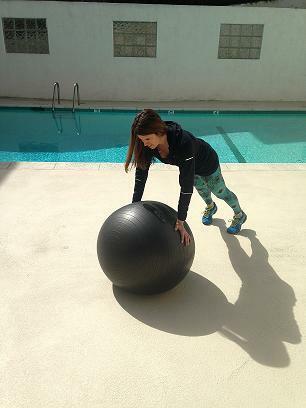 Keeping your core tight and stomach muscles engaged press the ball overhead while maintaining a neutral spine. Avoid arching your lower back when pressing the ball overhead. Step forward and bring your arms down, and repeat on one side for the whole set. Then switch sides. Starting with your feet together and ball held in front of you, step out to the right, kicking your right hip out and aligning your right knee over your ankle. Keep your left leg straight. Sitting your hips back, tap the ball to the outside of the right foot as you lunge. Once you tap the ball, push off your right foot to a standing one legged balance, keeping your right foot lifted and the ball into your chest. Repeat on the right side for a total of ten reps before switching to the left side. Standing in a wide squat with your toes slightly turned outward, descend your hips back aligning both knees with the ankles, and angling the knees in the same direction as the toes. With straight arms, tap the ball down, and then bend the elbows to drive the ball overhead. Whenever you go through the midline of your body, keep the ball tight to your body to avoid any torque to the lower spine and shoulders. Keeping your arms straight out in front, below your shoulder height, rotate your whole body to the right side, pivoting your toes to face the side you are turning to. Keep your core engaged the entire set so that you work every muscle in the trunk. This exercise is excellent for training your oblique plane which strengthens the body for movements that involve rotation. This advanced exercise calls for pushups on the ball itself. If you cannot safely balance on the ball due to lack of upper body strength, then you have two other options. Either place the ball up against a wall and then do the pushups, or do the pushups on the floor altogether and build yourself up to a stability ball pushup. If you can do less than the recommended rep range well, then do what you can and work your way up to ten. It is all about the quality of movement vs. the quantity in challenging exercises as such. Lay on the ball on your belly with part of your chest supported on the ball. (The more forward you roll up on the ball, the more challenging it is). Start with your arms straight in front of you, palms facing inward. Fingers together, keep your chin tucked as if to be holding an apple with your chin. Keep your legs engaged. Slowly rise up a couple of inches, lifting your chest upward, but keeping your gaze down at the ground. Do not look outward because then your neck isn’t neutral. On the lift, squeeze your shoulder blades together in the back as if to be squeezing a pencil. Exhale on the lift, hold at the top for a moment, before descending back down to starting position. Be sure to view the photo as it represents the proper positioning of the hands on the lift. 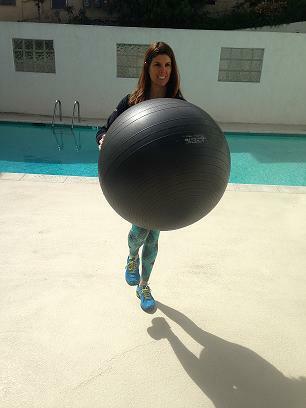 Walk yourself out with your shins on the stability ball. 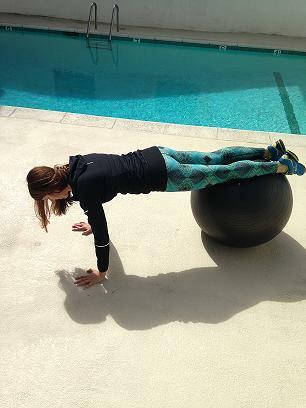 Get yourself into a plank position and first stabilize on the ball. Once you feel stable, ground your hands down as you pull your knees into your chest. Keep your gaze between your hands and squeeze your core tightly as you exhale the knees to where you have a slight curve in your back contracting your abdominals. On the inhale, return your legs out straight to starting position or plank. Same as the reverse crunches, position yourself into a plank pose. 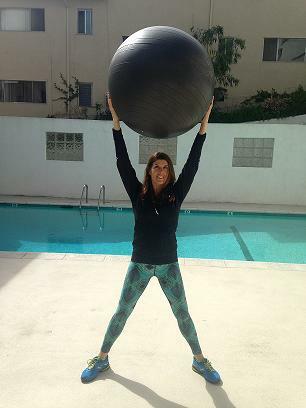 Once you are stable on the ball, keep your abdominal wall engaged as you lift one leg off the ball about 4 inches up. Without arching your lower back, squeeze every muscle in the body to help stabilize in this unstable position. Slowly lower down and alternate between sides. The goal is to keep your upper body still and engaged. Avoid pressure in your wrists or shoulders by depressing your shoulders down away from your ears. Be sure to exhale with every leg lift and inhale on the way down. This program can be performed on the road, or when you simply don’t want to go to the gym. Keep that body moving every week so that you can optimize your health! By SELF By Jessica Girdwain, SELF Suddenly, seeds are everywhere -- beverages, bars, you name it.